This week the Horror Duo chat about the warming temperatures and how this is an early sign that students will soon begin their summer vacations. Inspired by this, they take on a pair of school related flicks. 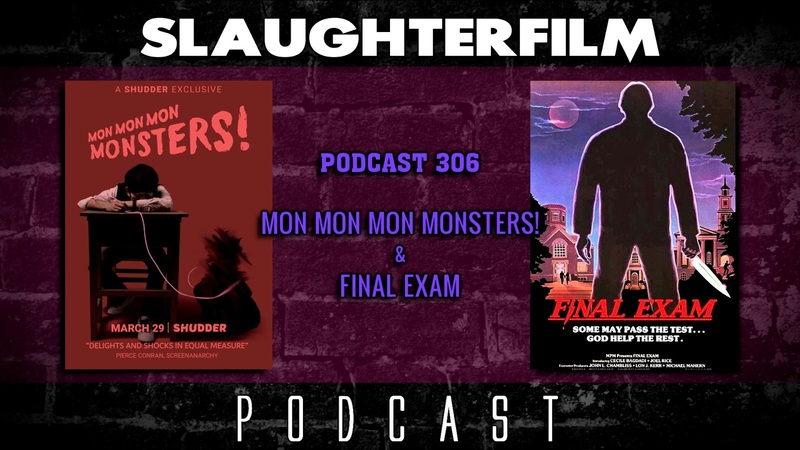 Forest discusses the Shudder exclusive Mon Mon Mon Monsters!. Cory covers the golden age of the slasher movies with Final Exam - proving it to be the Gone With the Wind of the slasher movies. They also chat about the WWE's Greatest Royal Rumble which was very obviously little more than a Saudi cash grab. They also cover the capture of the Golden State Killer and how public DNA records are used to solve cold cases. All this and Cory uncovers the truth behind #1 Pencils and "Thanos: Mands of Fate"! For more Slaughter Film news and reviews, as well as show notes and special events, make sure to visit our website; SlaughterFilm.com. 20:22 - "Mon Mon Mon Monsters!"